Now celebrating our 5th year in a row! 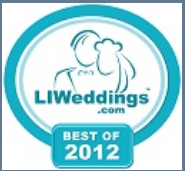 We are very pleased to announce that for the 5th year in a row we have been named LIWedding.com’s Best of 2012 Wedding Vendors. The votes came directly from our Brides and Grooms that rated us highly for providing them with outstanding service. We are very proud of this and wanted to share the exciting news with you!